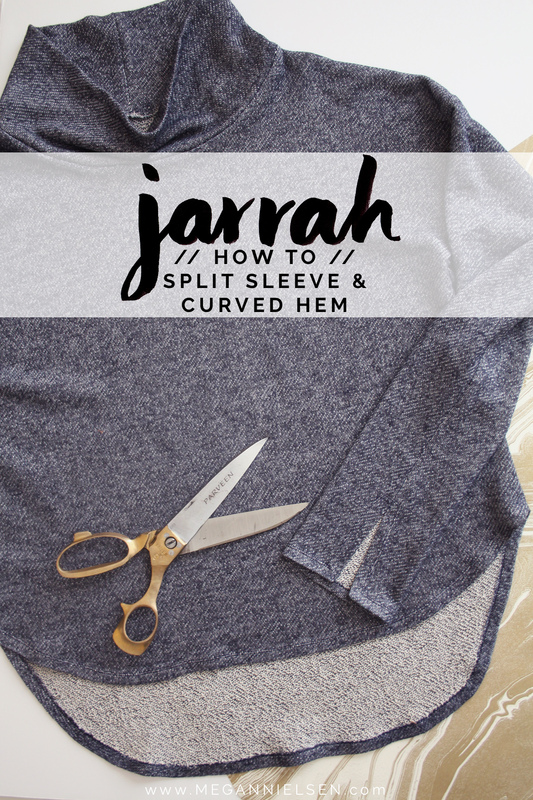 In today’s Jarrah sweater post, we’ll be covering everything you need to do to finish up views B + D.
First, we will go over the split sleeve that is found in both views, and I’ll even show you a couple of different tips and options for finishes. Has anyone ever done a mitered corner before? It gives such a nice clean finish! I’ll also cover how to finish the curved hem of view B. But don’t worry – even though I don’t show you here, the straight hem of view D is exactly the same and pretty straight forward. Are you ready for this?! It’s a fun one! Ok, so if you are doing the curved hem, you may want to prep the first part of the hem before you do the sleeve and side seam. It’s technically optional, but recommended. It will make it easier later on. You don’t need to prep ahead of time for the straight hem. You can just do all of that one at the end. 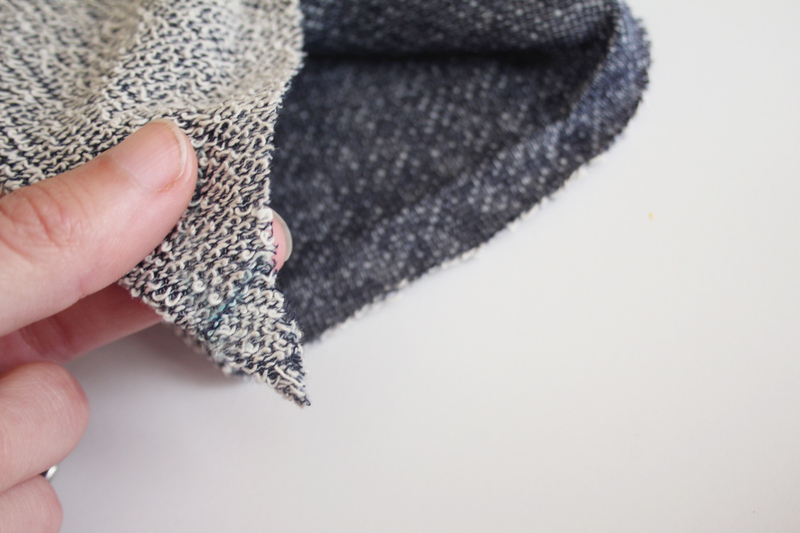 Lay your front sweater piece down with the wrong side facing up, and turn in the curved hem to the inside by 1/2″, pressing as you go. 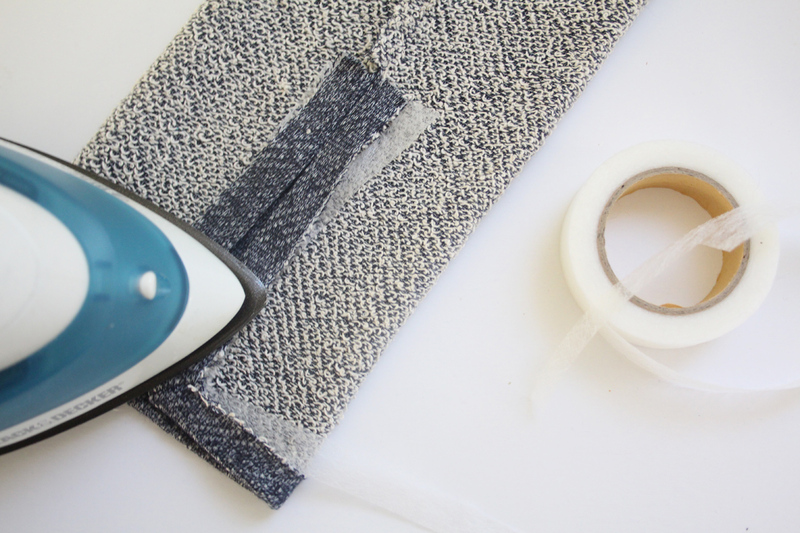 A fusible hemming tape like Stitch Witchery really comes in handy here! If you’ve never used it, here is what it looks like. 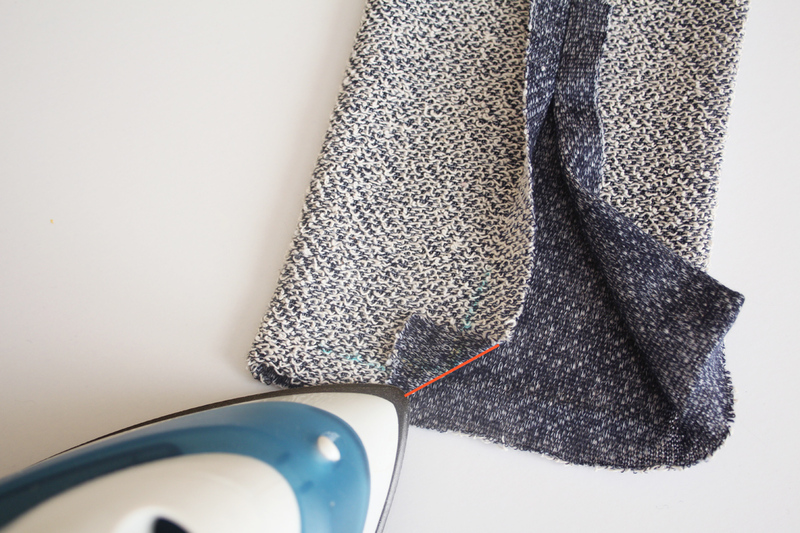 You don’t necessarily have to use it, but I promise it will make sewing a curved hem of a sweater SO much easier. 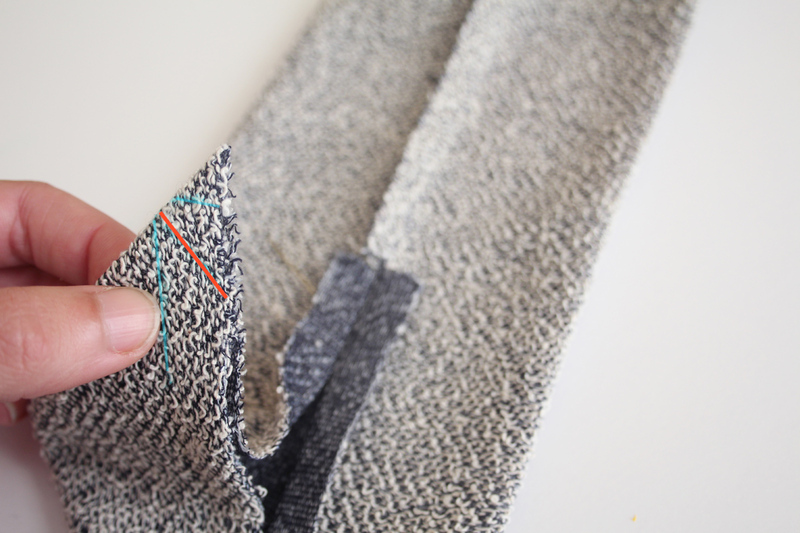 It fuses the hem in place so its more stable and doesn’t move around. No pins necessary and it’ll be easier to topstitch on. 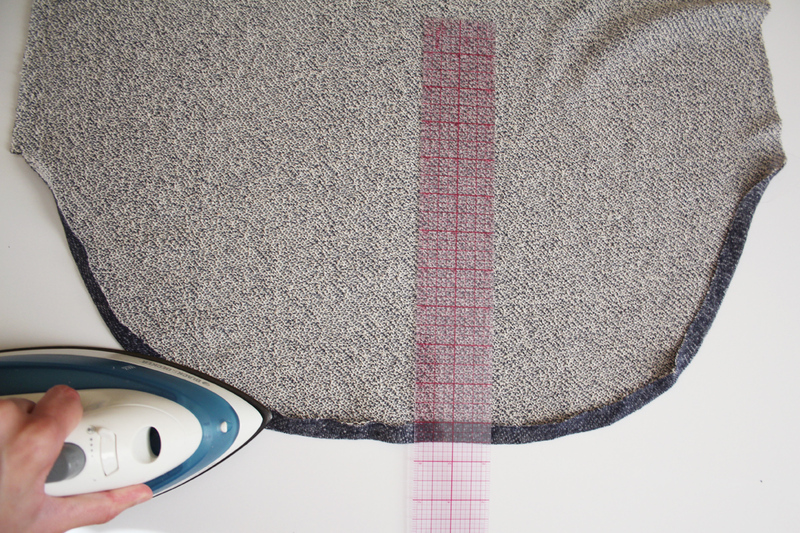 Sandwich the fusible hem tape in between the fold, and iron, following the instructions on your Stitch Witchery. Repeat for the back sweater piece. 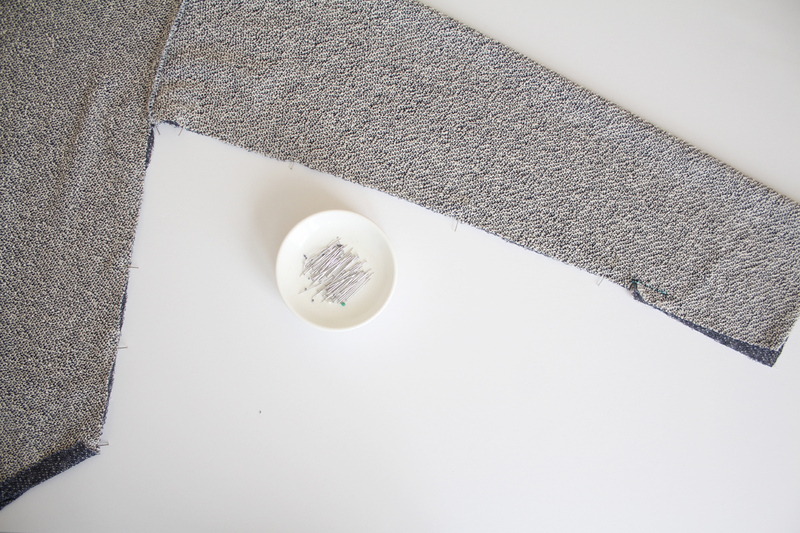 Turn your sweater inside out so that the front and back are facing each other with right sides are together. Line up the edges of the side seam and sleeve edge. Now see that little notch on the sleeve? Thats where the split opening will start. 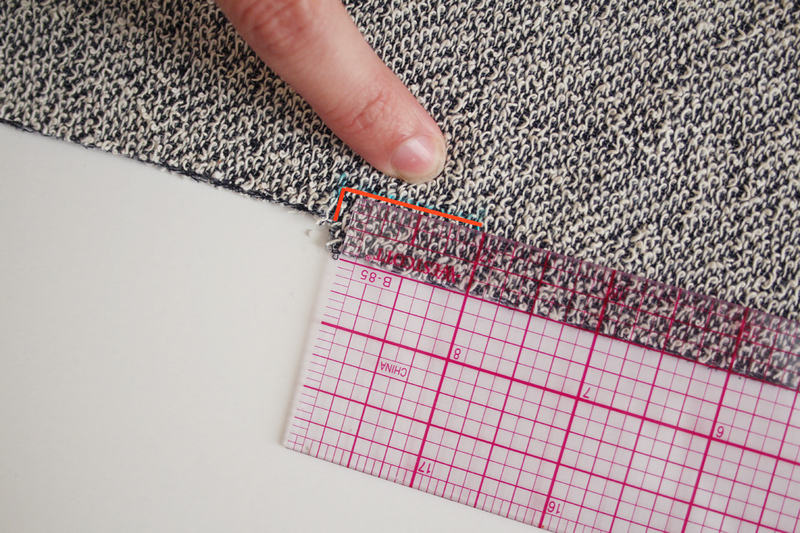 Now measure down 1″ from where you just clipped into the notch, parallel to the sleeve edge. Market this 1″ line, which will be 1/2″ from the sleeve edge. 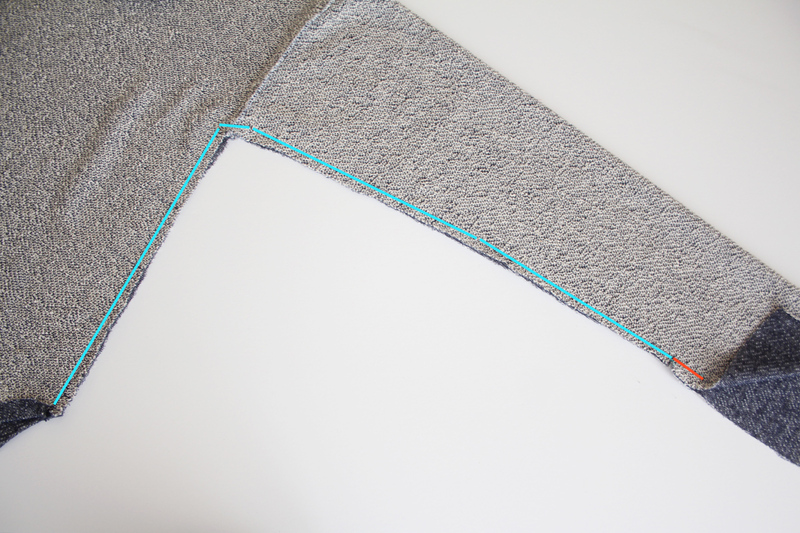 Sew down this line using a straight stitch. Again, it will be 1/2″ from the raw edge, and 1″ long. 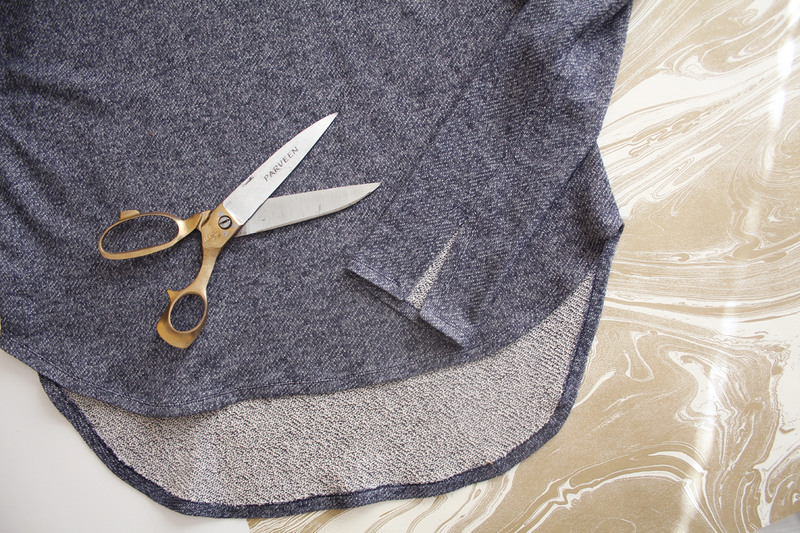 Line up the rest of the sleeve and side seam above the notch. Pin in place, making sure to match up the sleeve seam at the underarm. 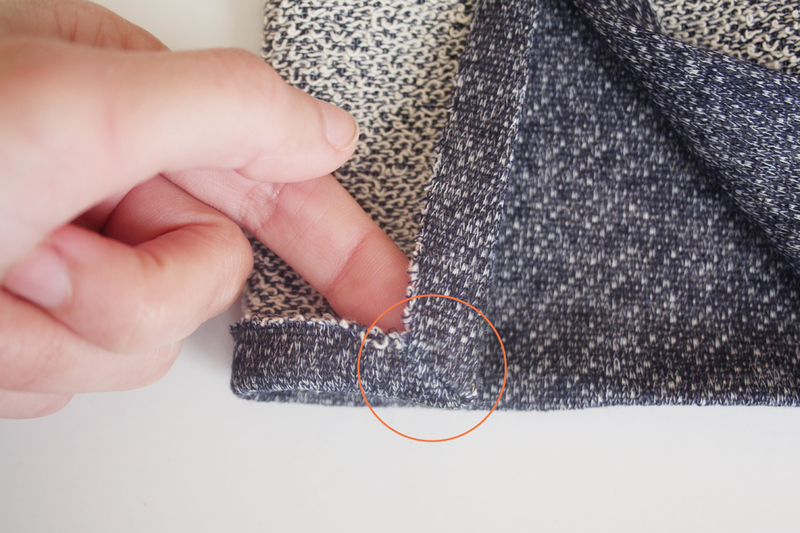 Sew in place 1/4″ from the raw edge in one continuous line, from the sleeve notch, around the underarm, all the way down to the hem. 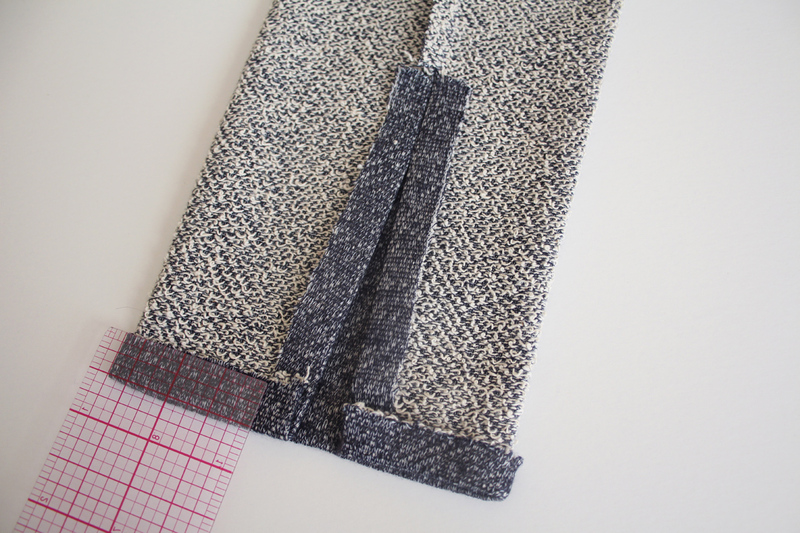 Use a zig zag stitch or serger. 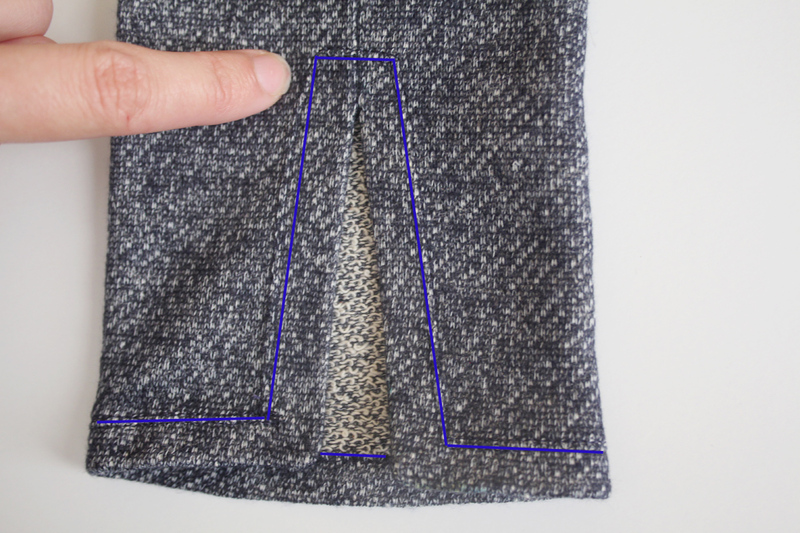 The red line above is where you sewed your 1″ mark below the notch. 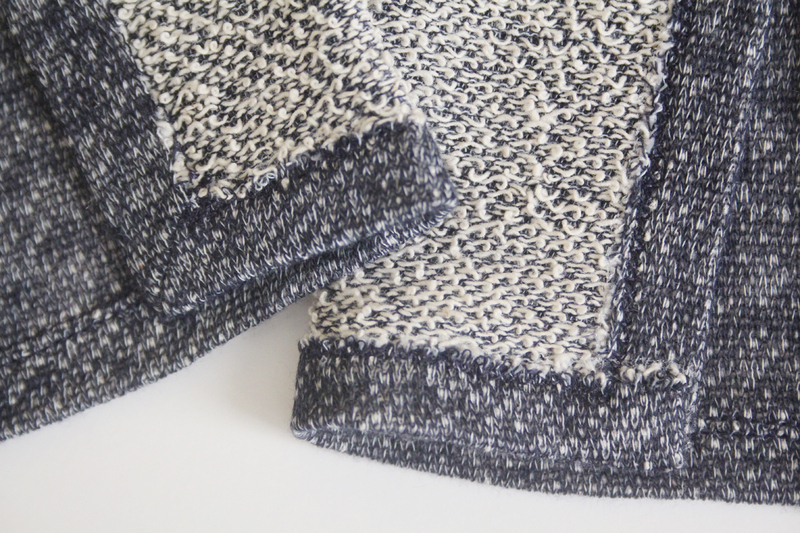 The blue lines your continuous side seam stitch. Here’s a closer look. 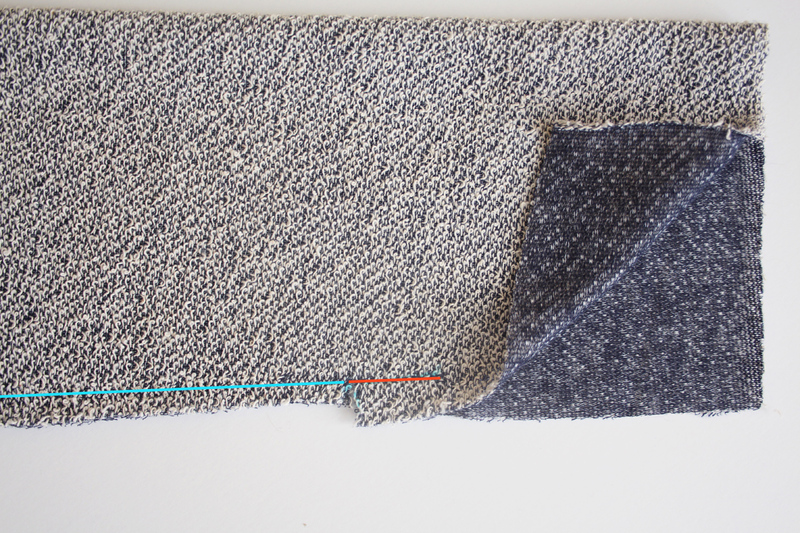 The two lines of stitches should match up together at the notch. And you can see that the lower half of the sleeve is still open. 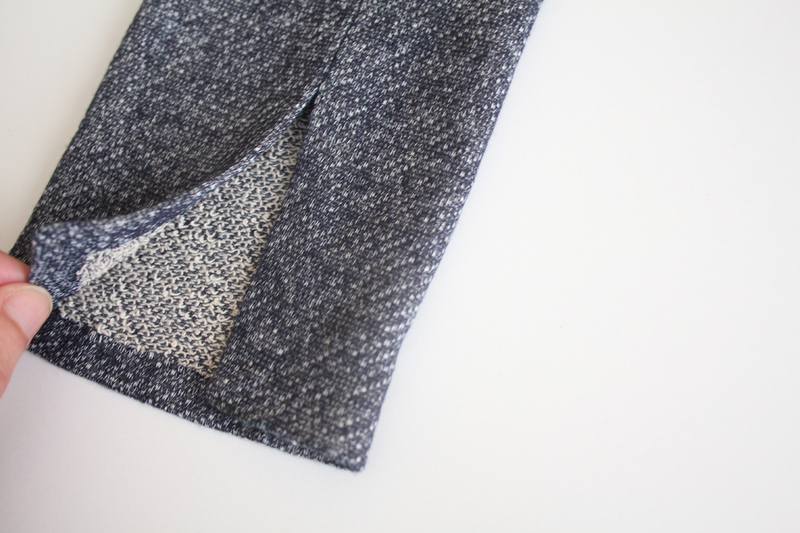 Also turn under the sleeve hem by 1/2″ as well. 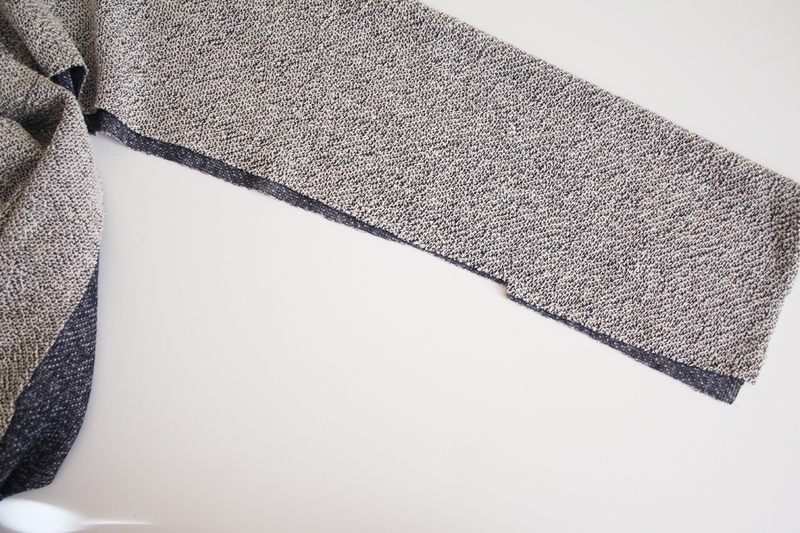 This creates a nice and clean finish at your corners, if you’d like to try it. 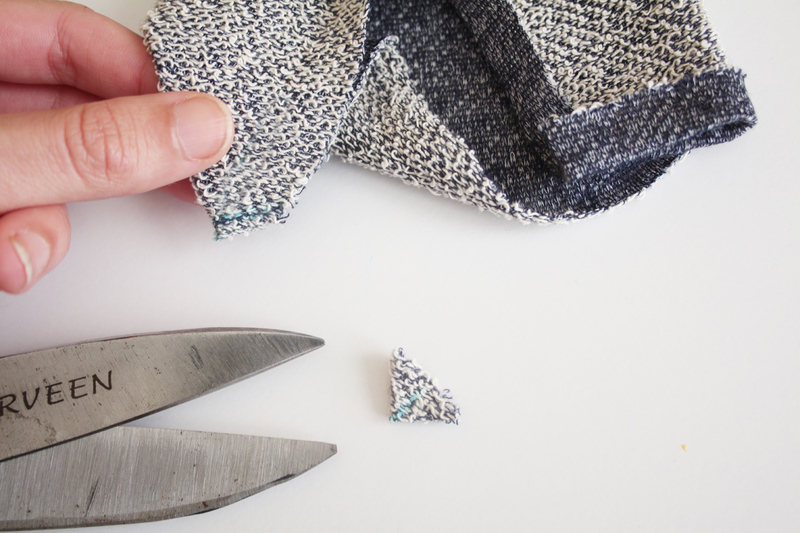 If you’ve never done this technique before, you may want to do a test round on scrap fabric first. 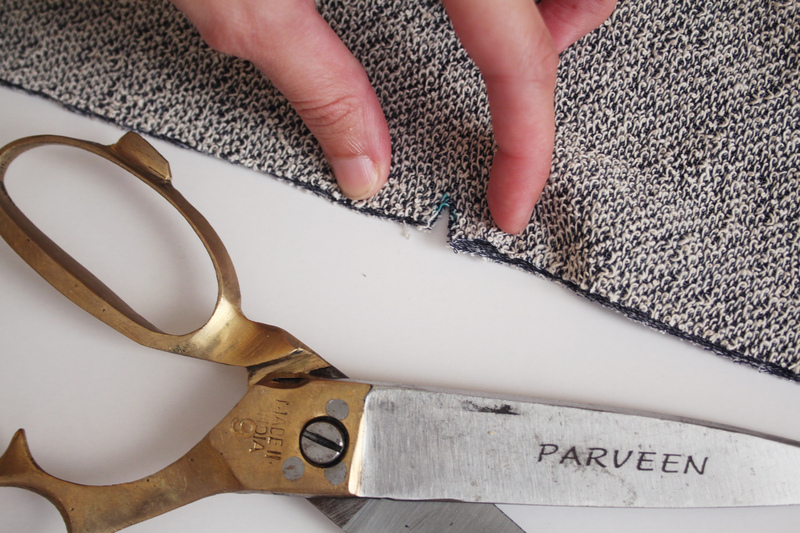 Unfold your split seam and hem and mark the fold lines. Mark from the right side of the fabric, too. Now fold in the corner diagonally so that the crease lines line up with each other. That’s why I like to mark them from the front, too. So that it’s easier to see them line up. Press this diagonal fold very well. The red line above shows the new crease that this creates. Mark this crease as well (on the wrong side of the fabric). Now fold the corner right sides together, lining up the edge. Remember – those blue lines above are your seam creases. The red line is your diagonal crease. 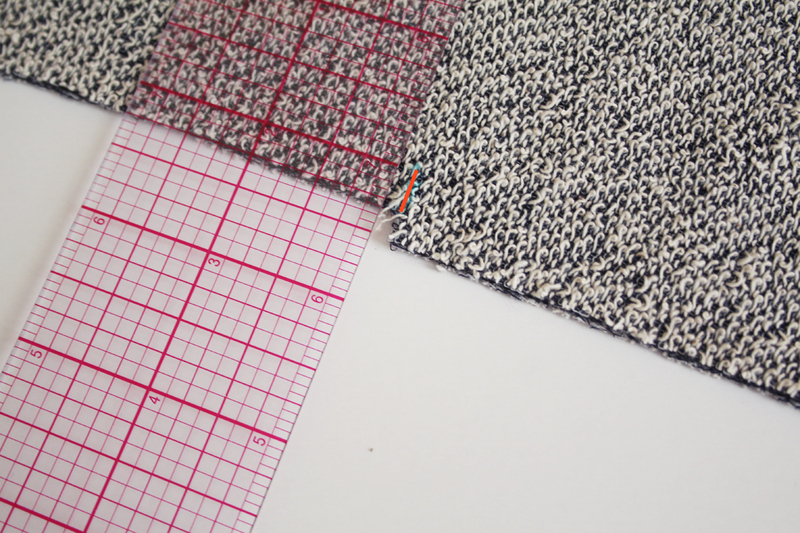 With the right sides together, you will be stitching along the red diagonal crease line. 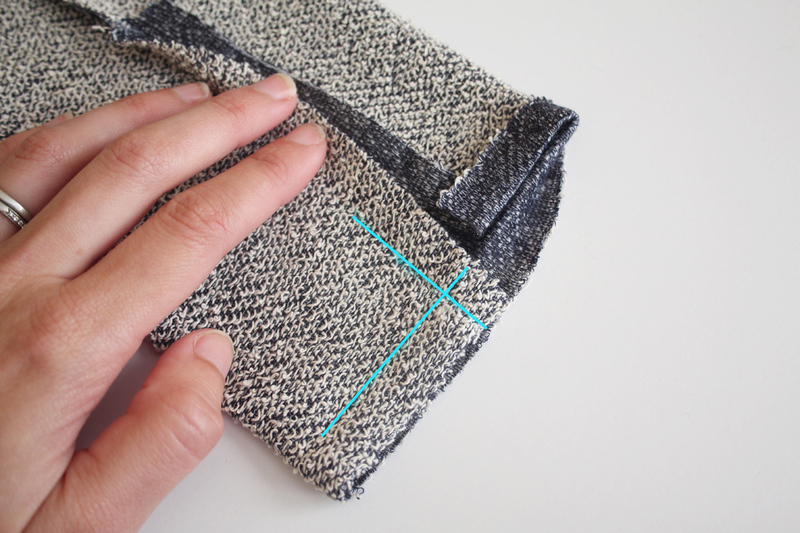 Stitch along the diagonal crease using a straight stitch, make sure to backstitch. Cut off the excess and clip the corner. Now turn the corner back around towards the inside of the garment. See how the corner now has its own seam? Use a point turner or something similar to push the corner out and get the perfect point. And then press well again. I know this isn’t the easiest to see, but, the corner on the left side is a mitered joint, the corner on the right is just turned under. 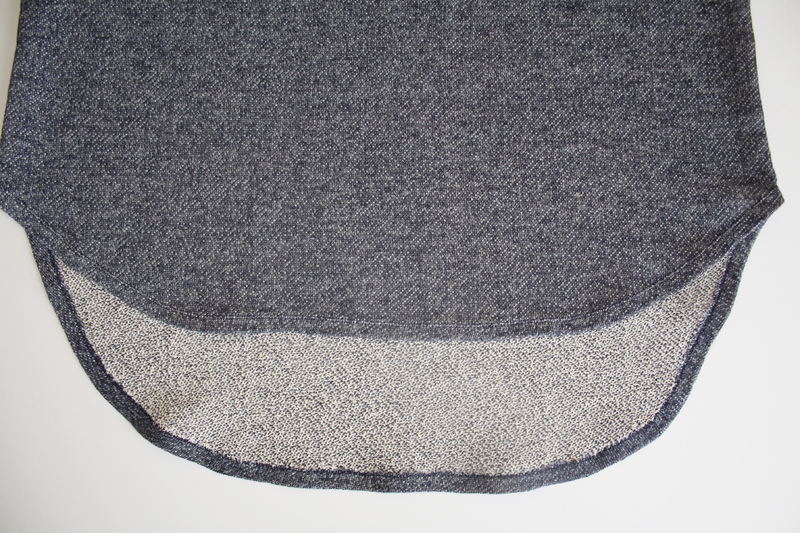 Whether you choose turned up corners or mitered corners, we can now move on to hemming and topstitching the sleeve. Just like with the curved hem I showed you above, you can choose to (or not to) use a fusible hem tape to stabilize and hold everything in place before topstitching. Just sandwich it in the folds and iron using the directions. Here is what it looks like when its all folded under and ready for topstitiching! From the right side, topstitch along the hem and split sleeve just under 1/2″ from the folded edge. 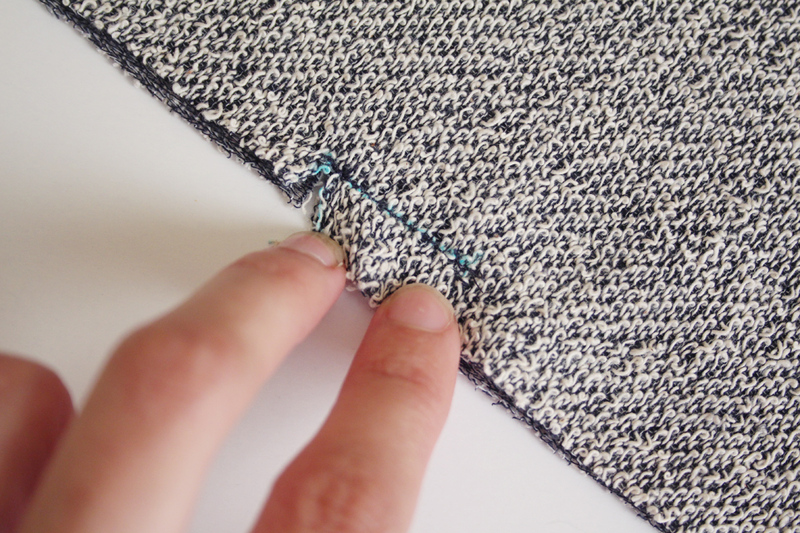 Use a zig zag stitch or twin needle. 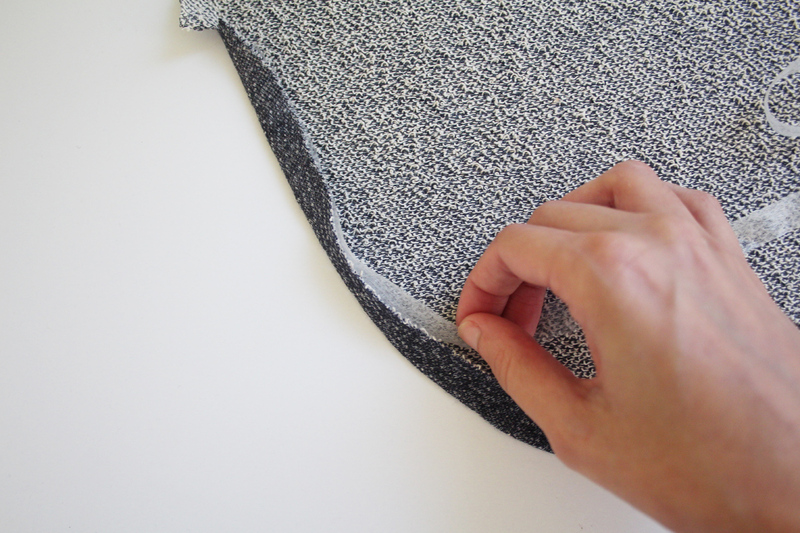 Do this in one continuous stitch, pivoting at the corners and around the top edge of the split. Now that that’s done, we can finish the hem! 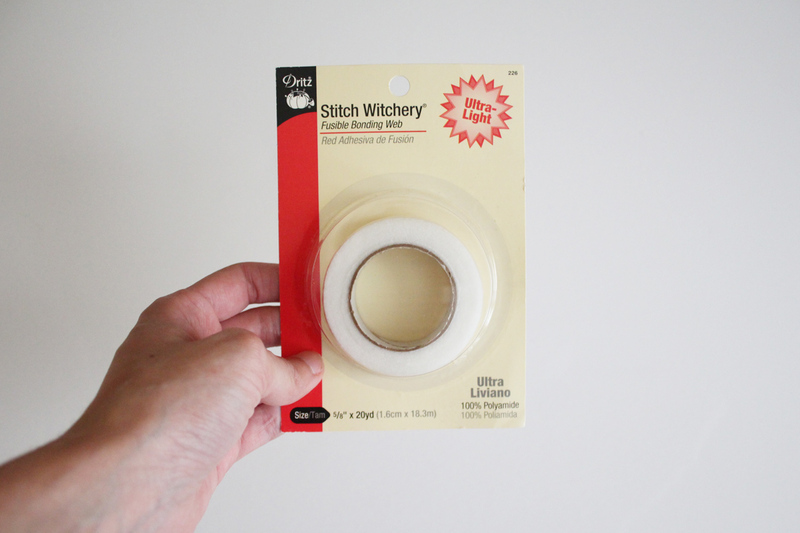 If you didn’t prep your hem early on, now is the time to do it – turn it under by 1/2″ (using stitch witchery if you would like). I went over all of this at the beginning of this post. If you already did this step in the beginning. 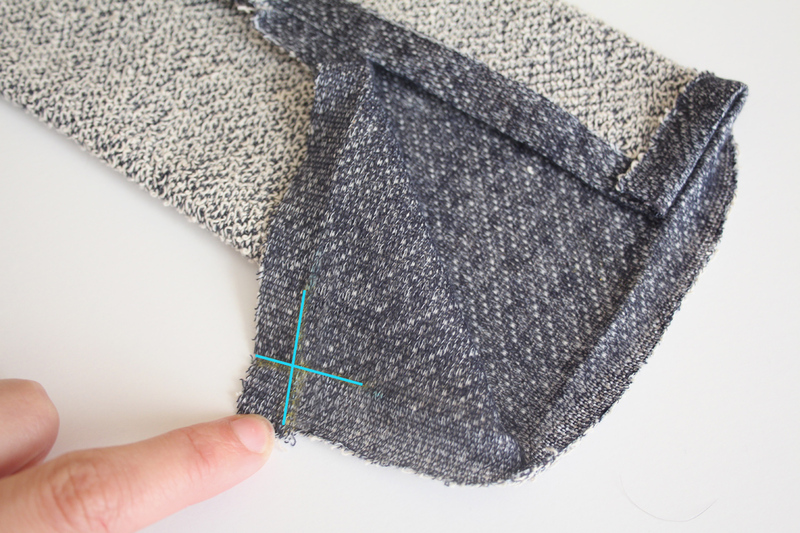 You can now just topstitch along the entire hemline 1/2″ from the edge. 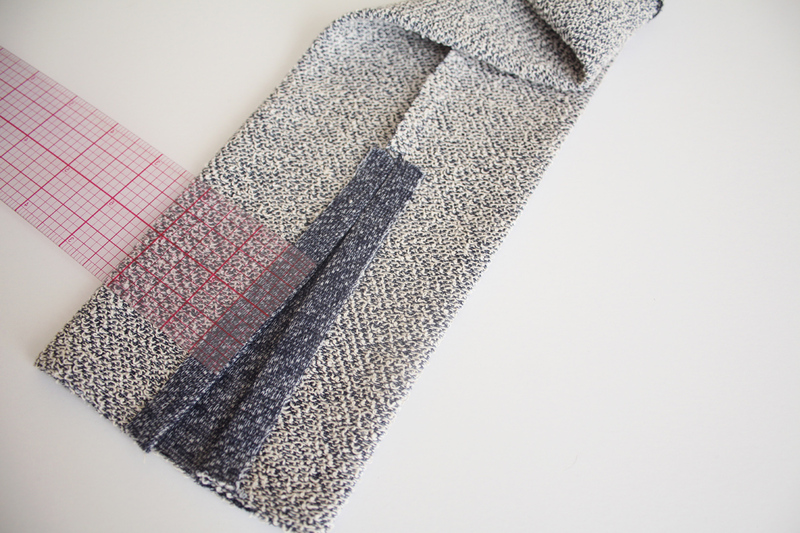 Use either a zig zag stitch or twin needle. 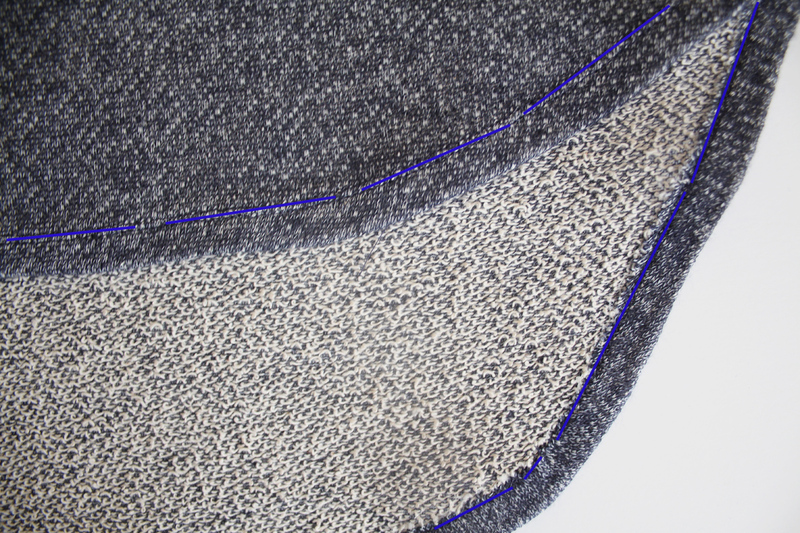 I know its harder to see on this fabric, so here is a close up with some lines to show you where I topstitched. This is one continuous stitch around the entire hem. 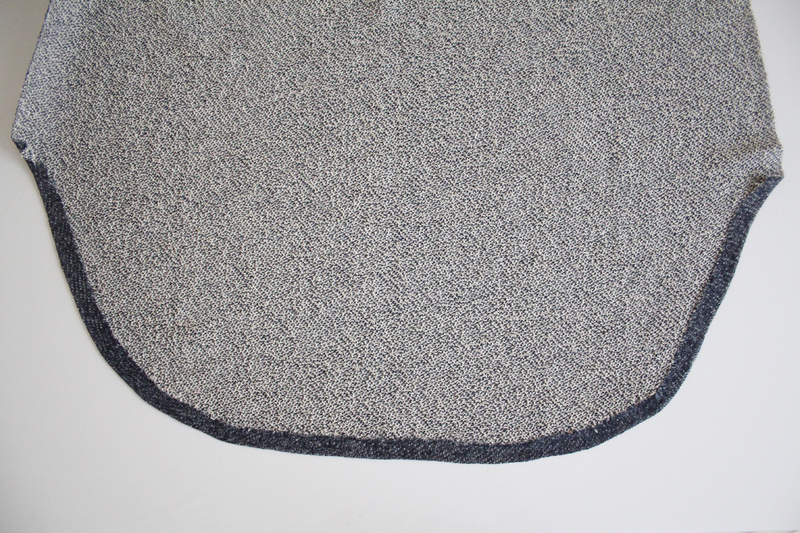 And this also goes for the straight hem of view D. Whether you are doing a curved or straight hem – this step is the same! And that’s it! If you made view B or D, your sweater is now complete! 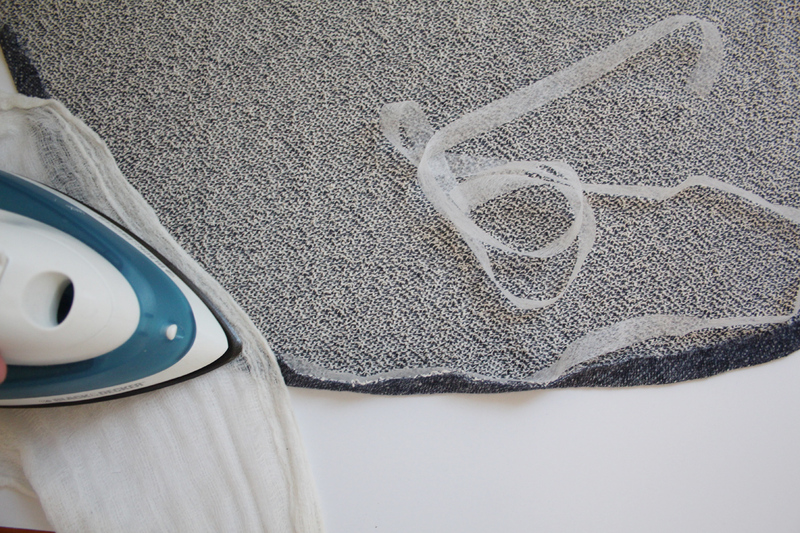 For curved hems, I overlock the fusible hemming tape to the wrong side of my hem, using the differential feed on my overlocker to ease in the fabric, being careful not to cut off any of the tape. 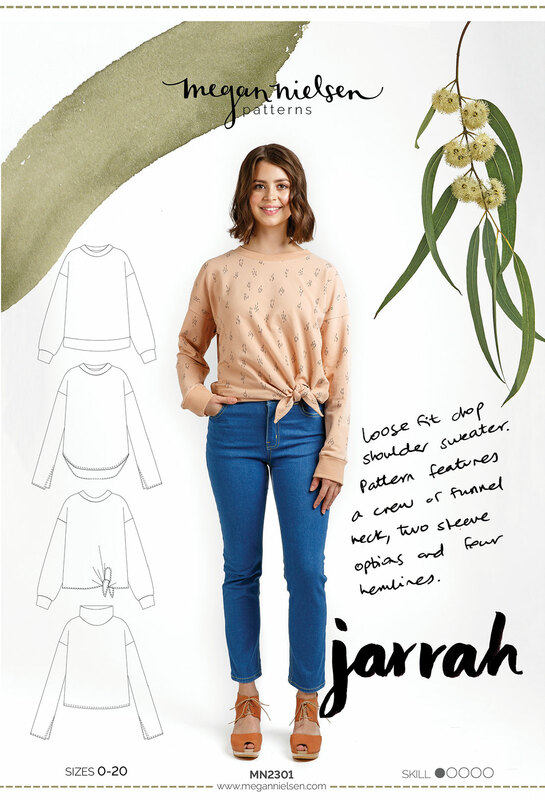 Hi Meg and Holly, in the instructions on page 13 you mentioned that the same method as for the sleeves may be used for the side seams at the hemline. 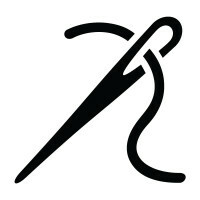 I’ve tried it but without success as I wasn’t sure where to clip and in which direction to sew. I’d appreciate hearing a bit more details about this as I really like how the sleeves look.